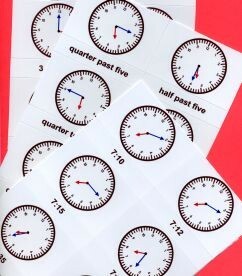 The laminated labels and cards of this series provide 4 activities on Telling Time on a clock or watch. Both twelve-hour and digital expressions are introduced to the child by following a gradual procedure. All exercises are coded to coordinate with the Albanesi Curriculum Program (ACP) for math.